"My childhood seems like a ghost town, filled with blurred images and nightmares. And when I look back I know that my memory is hopelessly flawed and entangled with my imagination." I can't count how many movies I've seen over the years. Who can, really? But I do know one thing: the more films I see, the less surprises there are to experience. It seems there are so many rehashed plots, predictable story lines, and just plain dull scripts littering the landscape that when a film comes along that actually manages to make me expect the unexpected, then I sit up and take notice. 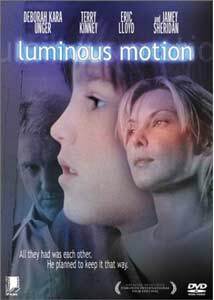 Bette Gordon's offbeat 1998 drama Luminous Motion is one of those unusual treats. Ten-year-old Phillip (Eric Lloyd) and his mom Margaret (Deborah Kara Unger) spend their time cruising around the country, literally living in an aging red Impala. Mom turns tricks in local motels to make money, occasionally stealing money from her clients while they sleep, while young Phillip spends the night in the car. It's a far from conventional lifestyle, but the two appear to be making the most of it. Their relationship is very strong, and it's clear that they each live for each other. Margaret has the kind of easy, natural rapport that all parents wish they could have with their children, even if her unorthodox method of providing for her son seems completely insane. Luminous Motion is a quirky drama that doesn't play by the standard rules. For starters, Phillip has "visions" which often cause him to see and speak with people that aren't really there, such as his absent father Henry (Jamey Sheridan). The people in his visions appear slightly blurred and jittery, and often offer up important, and in some cases deadly, advice. Phillip's perception of what is imaginary and what isn't is so skewed that he doesn't realize anything is wrong, and he has difficulty trying to separate fact from fantasy. As Phillip's strange behaviors increase, the film quickly becomes a much darker ride as his relationship with his mother, the person who is his whole life, is severely strained. To make matters worse, Margaret has her own demon, alcoholism, that threatens to shatter the foundation of their dynamic family duo. When an edgy drama features a 10-year-old as the lead it requires an exceptionally effective actor. Eric Lloyd's performance of Phillip, which is for the most part very, very good, only sometimes crosses that narrow boundary into overly cute child actor spouting profound thoughts, at the outset at least. As the film progresses Phillip is slowly revealed as a smart, but emotionally disturbed young boy, and Lloyd contributes a strong enough acting job to make his character, if not believable, at least intriguing. Deborah Kara Unger, as the troubled mom, is the other key character in Luminous Motion. Unger could be mistaken Michelle Pfeiffer's sister, if Pfeiffer's sister drank a lot, slept around, and just didn't take care for herself. Her character's eventual descent seems to play true, and Unger's performance is most powerful during the darkest moments. I've seen enough dysfunctionally functional family dramas that I thought I knew what predictable events to expect as the film progressed. I was wrong. The Scott Bradfield screenplay, from his novel The History Of Luminous Motion, moves along enough fresh and different paths that I was never really certain how things would be resolved, if at all. I really liked the uneasy feeling I had, and that uncertainty that lurked just beneath the surface. Bette Gordon's tight direction retains a strong focus, and doesn't allow things to meander aimlessly, while still allowing for some visually creative and compelling moments. Gordon's eye for engaging visuals is highlighted during a sequence near the end of the film, as Phillip is discussing how atoms separate and eventually become something else, that is simply beautiful. Image Transfer Review: Winstar has issued this disc in a 1.85:1 widescreen transfer. Apparently the original print was slightly less than pristine, because the final transfer has a smattering of nicks and blemishes, more so during the film's second half. Regardless, the daylight scenes look fantastic, with a nice, full color field free of bleed. Colors, as well as flesh tones, look natural and realistic. An overall nice transfer from Winstar. Audio Transfer Review: Luminous Motion is the type of small film that plays like a much bigger film thanks to a rock solid Dolby Digital 5.1 track. The strange vision sequences that Phillip has throughout the film echo and swirl around eerily, moving from rapidly from the rear channels to the front, and back again. Lesley Barber's score, which at times seems to mimic that of a more supernatural flick, sets the off balance tone that lurks beneath the surface here. Nice use of directional imaging, most noticeably during the opening title sequence. Dialogue, as expected, sounds crystal clear. The optional 2.0 mix has a bit less punch, most significantly during the "vision" scenes. Other than that primary difference, this track maintains a decent level of fidelity and dynamic range. Extras Review: A full-frame theatrical trailer, cast filmographies, 16 chapter stops, and a couple of DVD-ROM weblinks are the extent of the included bonus materials. In general, nothing but filler. Luminous Motion is one of those rare dramas that doesn't play by the rules, and the plot constantly moves in unexpected directions. Director Bette Gordon applies a number of creative visual touches, and Eric Lloyd and Deborah Kara Unger create a pair of unusual characters that need to be in constant motion to survive. If you enjoy unconventional dramas, this is worthy of at least a rental.